Angela's published works speak for themselves. Read more about her style and design decisions below. The open, unfit kitchen “has a rawness to it, like found pieces that came together over time,” says Angela Otten, kitchen designer with William Ohs Kitchens. Open shelving along with built-in cabinets featuring chicken-wire panels sit alongside furniture-inspired painted pieces and a floating island. Woods used include antique, reclaimed oak; knotty oak; and alder in rough-sawn, painted, and rubbed finishes. Parana white honed granite tops the counters and island, providing the cool look of marble with the durability needed in a hardworking kitchen. 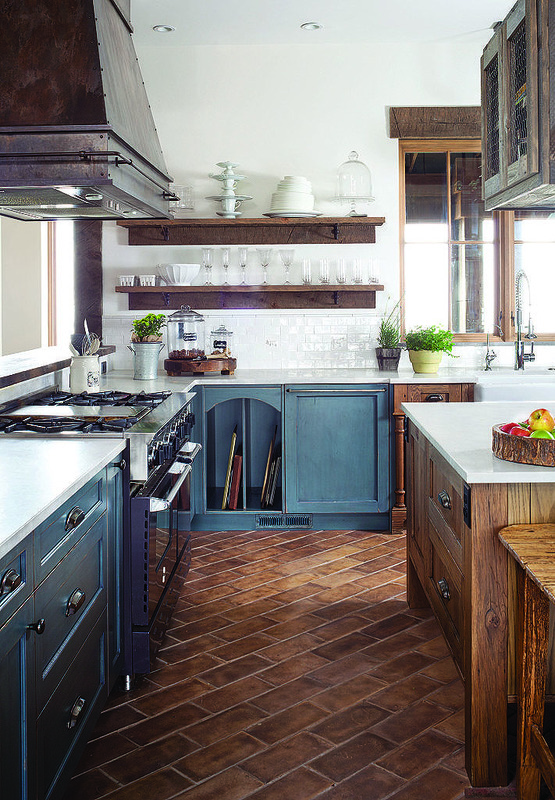 Concrete mimics earthen tiles on the kitchen floor and flows smoothly into the antique oak flooring in the main areas. A weathered metal range hood fabricated by Raw Urth helps define the space. Angela's designer tip: One of my favorite things to do is work in zones, and the prep zone is most important. I always have a prep sink, a single pull-out trash, cutting boards and knives all in the same area. The renovation included removing walls and soffits, replacing drywall, floors and fireplaces, and adding square footage for a new kitchen and master suite. Kitchen and bath designer Angela Otten joined the team early in the process, handling space planning and introducing finishes and materials to fulfill the Kneibs’ vision. With décor that features light, color and an eclectic art collection, this renovated ‘70s-era house reflects its happy homeowners. The new kitchen, designed by Angela Otten, is sleek and efficient, yet cheerful and welcoming. Open shelves below the peninsula offer an abundance of accessible storage. The wood veneer pendant lamp from YLighting adds a burst of color, and the raised marble counter invites seating while also providing some separation from the adjacent family room. Maple Cherner Vortex Chairs offer a contrasting sculptural element. He likes two colors in particular. “Red and gold bring luck and prosperity,” he says. So when William Ohs designer Angela Otten started thinking about what she would do in the kitchen—a collaboration with designer Kristi Dinner—she used an accent wall of bright red tile, selected by Dinner, as her guide. How to make that wall pop even more? 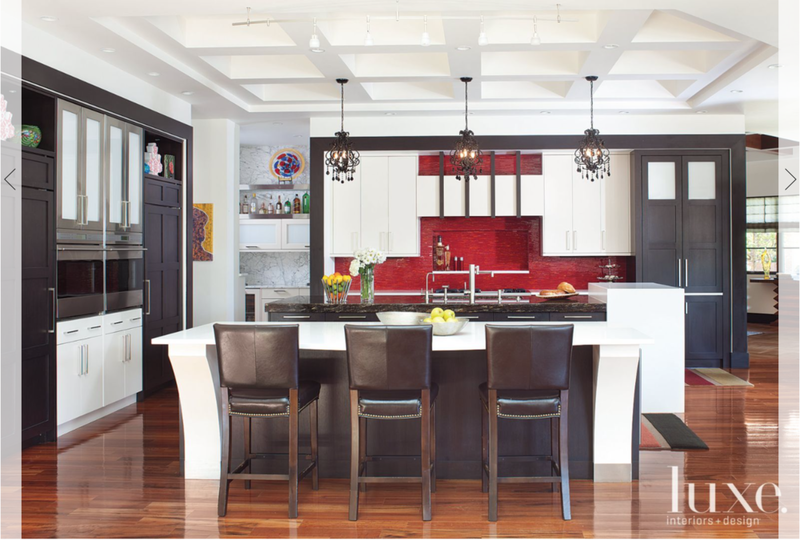 “We used a neutral palette in the cabinetry so it recedes around the red,” says Otten. The room’s darker cabinets are a shaker-style, ebonized rift-cut white oak; the lighter have a simple white-finished slab-style door. Back-painted white glass inserts are set into stainless-steel frames to create lively contrast. Curved brackets hold up one island’s countertop, and customized cabinetry was crafted for dishware. “Authentic Craftsman detailing that looks like it was original to the house”—that was Otten’s goal when she created the kitchen of this 1908 house in Denver’s Country Club neighborhood. She began by using quartersawn oak (a hallmark of the Arts & Crafts period) not only in the cabinetry around the stove and in the island but also in the floors and the box beams on the ceiling, the latter of which offer their own symmetry by lining up exactly with the stove hood and with the cabinets that bookend the leaded-glass windows. Carrying out the Arts & Crafts feel are schoolhouse-style pendant lamps over the island, which is topped with Carrara marble. Otten added simple, geometric design elements for the inset cabinet doors (which sit flush with the frame, with exposed hardware) and door casings, including the mullion detailing on the glass cabinets and refrigerator panels. Finally, by insetting the Wolf range within its own cubby and hiding the hood within an oak frame that is part of the architecture, “we created a true hearth; you could imagine even having a fireplace in there,” Otten says. Remodelers report that the appearance and atmosphere of a space is a stronger motive for remodeling than function, revealing that the kitchen may indeed be the heart of the home. 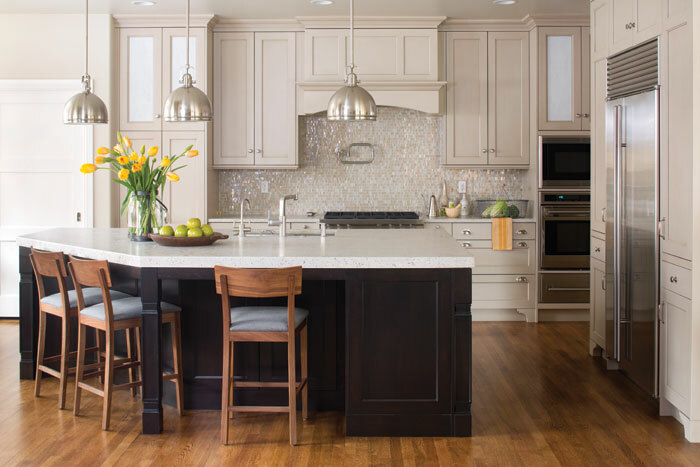 Homeowners’ most popular choices when designing a kitchen are an island, hardwood floors, soft colors, white cabinets and stainless steel appliances. The most important appliance is a “chef’s stove,” which could mean induction cooktop or gas, European or American. Some home chefs swear by Viking or Wolf, but the British Aga and French LaCornue are appearing in an increasing number of American homes. Retro appliances are adding a splash of color to the marketplace and kitchens. A designer trend is the return of marble. Beautifully grained wood will always be on-trend as well, but white cabinets, whether in sleek laminate or painted wood cabinets, are resurging in popularity. Homeowners are storing everything from chips to china in drawers, which are replacing cabinets under countertops due to easy access. DLM chose five kitchens that marry these examples of style and function seamlessly, and certainly beautifully. 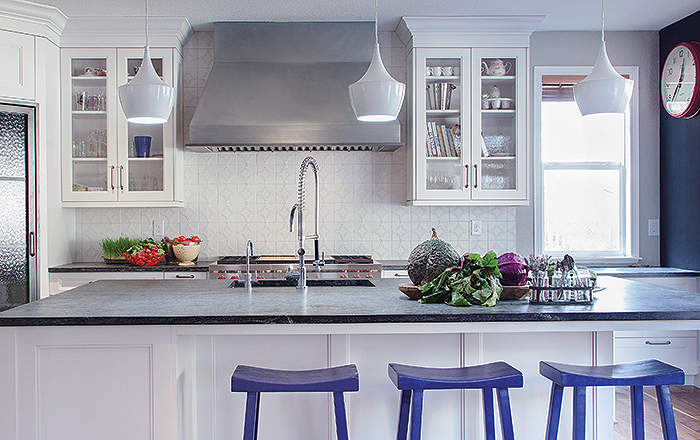 The original kitchen was designed 15 years ago with an emphasis more on function than beauty. By the time of the remodel, it was totally dated, with older appliances, beat-up cherry cabinets and a long narrow island with a bulky exhaust hood. “The client wanted to turn the utilitarian kitchen into a warm space that would act as the epicenter for her family of four,” says Angela Otten, who was hired to help revamp the space. The homeowner, who had designed several spec homes prior to this remodel, came to the table with lots of interesting ideas for making the space functional and good-looking: an under-counter refrigeration unit that the kids could easily access, plus compartments in the main island for homework and crafts. Overall, says Otten, the client wanted the kitchen to look clean and classic, yet warm and comfortable. 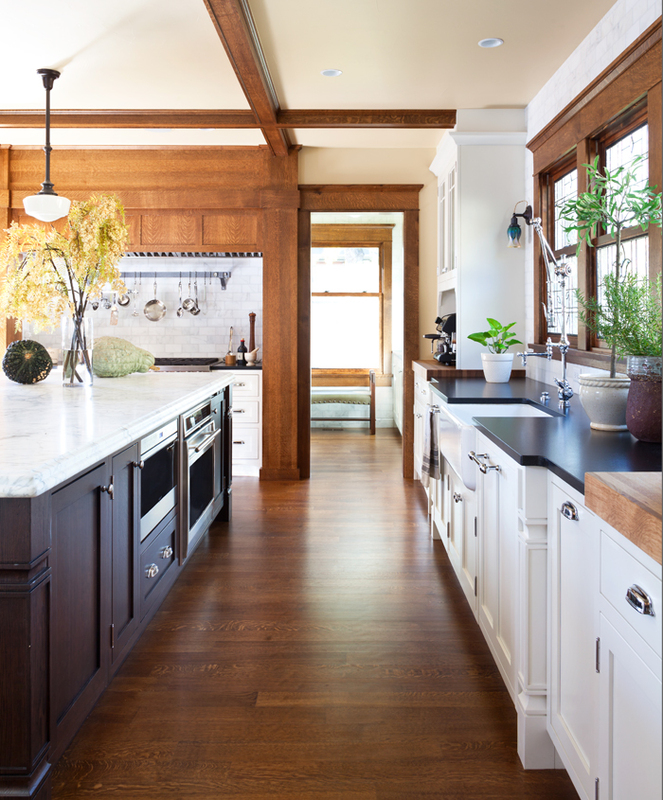 For starters, Colorado Master Builders & Architects added several feet to the kitchen to accommodate a larger layout. Next, Otten chose integrated appliances to keep the lines and surfaces of the room clean—including a hidden pantry entrance between two refrigeration/freezer units. Finally, she designed an arched niche to highlight an etched turquoise china buffet (built new, but painted to look antique) that displays fine dishes and adds interest. 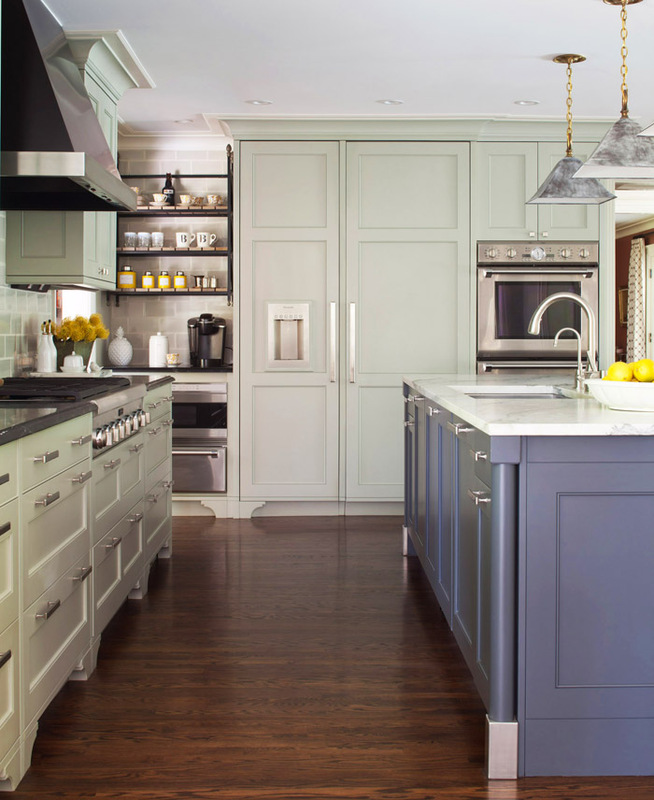 The range wall is a focal point with a stone-and-pewter hood and glass-paned wall cabinets. And three islands make up the center of the kitchen, each with a different purpose: the butcher-block island for prep work, with a cutting surface and prep sink; the center island for cleanup and casual dining; the third island for extra, easy-access refrigeration. intensive painting and etching style, add personality and unique style to the space. —On the island, the diamond-style pattern on the doors provides interest without being fussy. “We took cabinets with a very simple style and added detailing that catches your eye only slightly,” Otten says.